I first learned of Katarina Weslien’s work through the Boston-based choreographer, Daniel McCusker, who was one of 20 artists invited to participate in “Walking Kailash: an invitational project,” Weslien’s invitation asked the participants to gather specimens from a walk near a body of water where they live, a kind of pilgrimage akin to an epic journey of her own around Mt.Kailash in Western Tibet ten years earlier. Each participant was given a kit as a guide and asked to collect water and anything else along their walk, to make something of the experience. It was an open-ended invitation to be interpreted and performed. The portfolio of work we will show here stems from this collaboration. I’ve invited the artist to share a selection of images from each of three projects of her own from before and after this Invitational project. Elaine Sexton: Katarina, as this is essentially a “micro” interview, and you have a rich and varied body of work with tremendous back stories, I’m going to ask you to expand a bit on my brief introduction and link these three projects, with attention to your impulse to make the work, the materials you chose, and the idea of pilgrimage/documentation. Katarina Weslien: My practice as a maker is to pay attention to what it means to be human what connects us. I’ve traveled all my life, starting by boat from Sweden to the USA when I was twelve. I find the displacement of the familiar, including language, by the unknown, heightens perceptions, increases vulnerability and reveals networks of interdependent structures. I pay attention to the unfamiliar. I gather specimens, photograph, interview, archive what I find along the way, and spend time scrutinizing what I have collected and where I have been. I trust my intuition about what I experience and how the experience lives on through my making in everything from large-scale installations, video, photographs, intimate collage constructions and collaborations. ES: The first, embroidered water, started before the collaboration, and after your own pilgrimage. KS: The river Ganga starts in the Tibetan western plateau and travels across Asia to the Bay of Bengal, supporting hundreds of millions of people as it flows. Over the past 30 years, I’ve traveled to the beginning and end of this river and places of intense cultural beliefs on the riverbanks in between. I’m curious to know how meaning is made, how we embody place through material making. The medium of fiber and its immersive tactile environments, its production, social and cultural history, extraordinary beauty and ingenuity have been my map to this exploration. I started out studying architecture until I sat down at a loom years ago. Understanding structure line by line, color in three dimensions, the physical possibilities of scale, and haptic capacities of a pliable material with a deep cultural history of labor, made me want to travel to the origin of cloth productions to better understand its timeworn meaning, methods of making and its language. On the pilgrimage route around Mt. Kailash the birthplace of venerable rivers in western Tibet is a sacred lake called Lake of Compassion. What does compassion look like? Does it have an image? Can compassion be contained? Like other pilgrims I collected water from this lake, later I examined it under a microscope and saw maps. My inclination was to embroider these images of compassion on Khadi, a hand spun, hand woven cloth politicized by Mahatma Gandhi as the cloth of resistance and personal agency during British rule in India. These images of compassion, from Mt. Kailash were the starting point for Walking Kailash an invitational project to perform a walk of compassion – whatever that meant for each participant, wherever they were in the world. The result of this invitation is archived on the website. www.walkingkailash.com. KW: Every twelve years, hundreds of millions of people gather by the confluence of the rivers Ganga, Yamuna and the unseen Saraswati in northwest India. The Kumbh Mela is the largest religious gathering (mela in Hindi) on earth. A tent city of twenty square miles is built on the dry flood plain of the rivers to house the many devotees who come to dip in the confluence of these holy rivers, with the belief and intention of obtaining immortality. I spent one month in this tented mega-city, wanting to know what it felt like to be among millions of people and how all could coexist in this small space constructed of cloth, under fragile circumstances meant to empty one of desire. I was surrounded by pilgrims – in the fog, in and by the river, on the road, in the railway station, and on bridges. I walked away from the crowds at the river towards the periphery of the ephemeral city where tents stood empty, where the fill of millions had not yet entered, where another kind of emptiness existed in quiet anticipation. 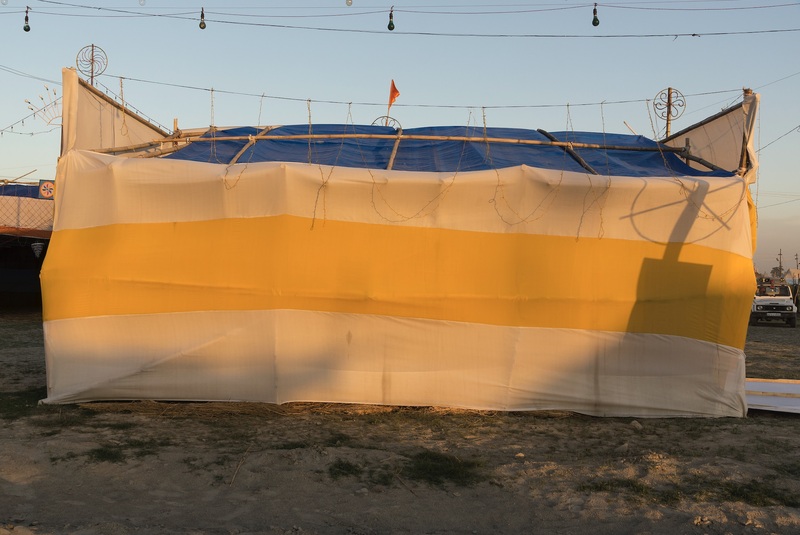 Tents’ sewn panels protect, hide, reveal and contain; like the skin on our bodies, they are fragile and impermanent. 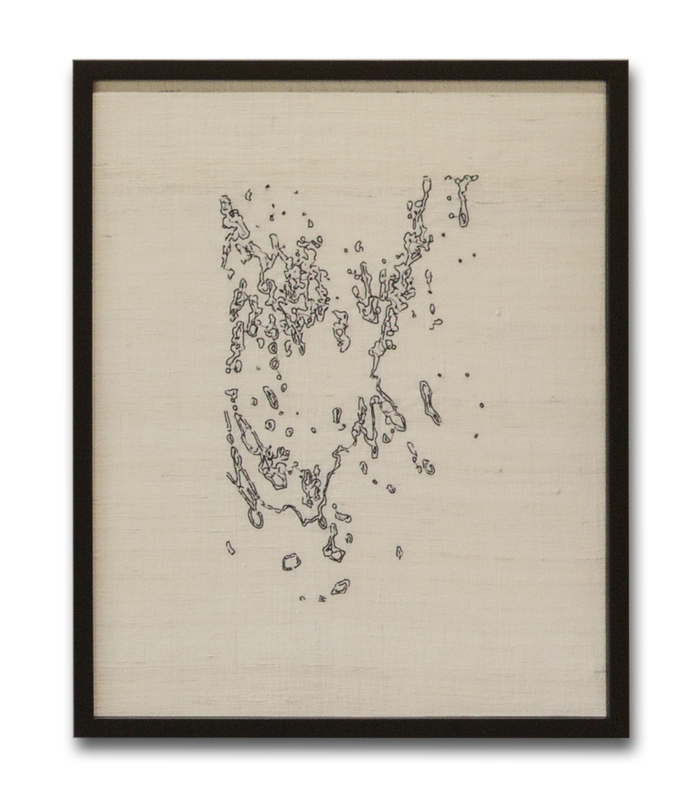 ES: The next is made up of water stains, works on paper, matched with fabric sewn over the stain, sewn collages, one-of- a-kind-pieces. KW: Walking in Varanasi, on the banks of the Ganga, one of the oldest continuously inhabited cities in the world, with settlements dating from 11 BC, I followed the inscribed path between many temples, gathered gifts/Prasad from each, and returned to the Kriti Gallery in the city where I bottled the contents of the visits and mixed them with water from the river Ganga. When the contents decomposed the putrefied water was poured on separate sheets of paper and left to dry over days. When dried, each stain contained an image from a specific temple. The stains were covered with sheer silk cloth, sewn on as a shield to cover preserve and protect the memory of being there, as clothing protects the privacy of the body. The cloth oddments were all gifts from the collection of Italian designer Cristina Bomba. KATARINA WESLIEN is a multi disciplinary artist and educator. Her exhibitions include Kohler Art Center, Bates Museum, the Finish Embassy, Women’s Museum in Washington DC, MASS MoCA, Kriti Gallery, India, Barbro Stenlund Gallery, Stockholm among others. Her work is in the permanent collection of Metropolitan Museum of Art, Portland Museum of Art, Cranbrook Academy of Art, Xerox Corporation, Bates Museum, among others. She is the recipient of numerous awards including the National Endowment for the Arts Fellowships and the Payson Foundation. Weslien is the former Director of Graduate Studies at Maine College of Art where she was also the Editor of the Moth Press; projects include interviews with Alison Knowles, Marina Abramovic, Amar Kanwar, Krzysztof Wodiczko and publication of Mapping The Intelligence of Visual Work by Anne West. She co-facilitated study trips to India for The School of the Art Institute of Chicago where she also taught in the Fiber Material Studies Department. 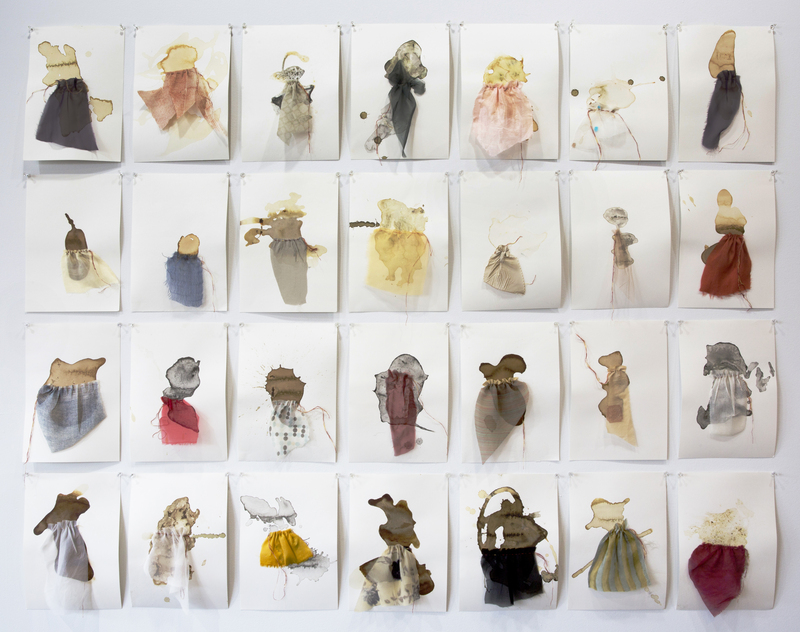 Weslien holds a BFA from Utah State University and received her MFA from Cranbrook Academy of Art. Weslien was born in Söderfors, Sweden. She lives and works in Portland Maine. She facilitates small group trips to India yearly. More information can be found at: www.katarinaweslien.com.